Even if you are not familiar with the story of the Jonestown Massacre, it is probable that you have heard of the metaphor, “Drinking the Kool Aid.” This metaphor refers to people blindly following a belief or philosophy, and like most metaphors, comes from a very literal event that once took place. While some contribute this saying to the Ken Kesey & the Merry Pranksters Acid Tests of the 1960’s, its more sinister referent is the Jonestown Massacre, during which 900+ people in a group known as the People’s Temple drank a lethal concoction of Kool Aid and cyanide led by their religious leader, Rev. Jim Jones. (Not to be confused with Brian Jonestown Massacre or this guy). Rev. 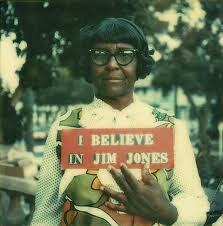 Jim Jones founded the People’s Temple on a message of brother- and sisterhood that spanned all races and creeds. While the story itself is unsettling and confusing, this movie adds to that feeling. It is easy to disassociate from the horror that is 900 people allegedly committing group suicide. I have always dismissed it as a cult full of mentally unstable people who made a decision that no rational-minded human being would make: to end their own lives and the lives of their family members at the behest of a maniac. But it becomes all too real when you hear the testimonials of the few members of People’s Temple who survived, witness the tense conditions at their commune in the jungle leading up to the moment that the Kool Aid was pushed upon the members of People’s Temple, and see the footage of the aftermath where piles of corpses include babies and children. 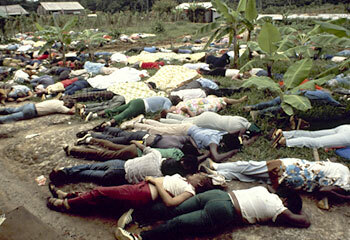 A fraction of the more than 900 people who ended their lives in Jonestown, Guyana, some willingly and some forcibly. 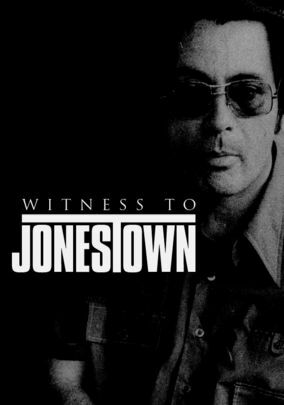 This isn’t even the first documentary I have seen on the subject of the People’s Temple and the Jonestown Massacre, but it is the best one that I have seen. I assume that because it is an NBC made for TV movie, it contains exclusive footage that could not be found elsewhere, including some of the last moments of Jim Jones’ drug-addled mental unravelling at the People’s Temple compound in Guyana, and audio footage of the actual mass “suicide,” which still haunts me. I still can’t imagine finding myself in the situation in which members of the People’s Temple found themselves, but hearing the surviving members speak of their experiences sheds a beam of light on the murky history of Jonestown and the People’s Temple. What is more disturbing and even less clear coming out of the movie are the motivations Jim Jones’ disturbed desire to exercise such lethal control over nearly one thousand people who loved and trusted him.